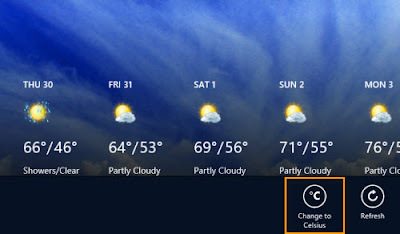 The Weather App in Windows 8 Metro start screen displays temperatures in Fahrenheit. This obsolete scale is popular only in the United States, and maybe in some other countries; the rest prefer to use the standard Celsius temperature scale. So if you want to change the scale from Fahrenheit to Celsius in the weather app, here is how to do it. The following method is for Windows Consumer Preview and Release Preview. If you are using Windows 8 RTM, scroll to the bottom of this article. Open the weather app from the Metro start screen and press Win+C to bring up the new start menu officially called the ‘Charm’ and click (or touch) on Settings. Alternatively, you can move the mouse pointer to the bottom-left corner of the screen to evoke the Charm menu. Now click on Weather Preferences and change the scale from Fahrenheit to Celsius. Easy when you know it, isn’t it? Update: In Windows 8 RTM, the method to change Fahrenheit to Celsius and vice versa has been made a lot easier. Open the Weather app and right click on the screen. You will find the "Change to Celsius" button at the bottom of the screen as shown below. thanks, i tried everything to get celsius, so far i thought it uses the localization settings (and i don't want to change that). Ctrl+C won't work for me, but ALT+C works ! Oh! it should have been Win+c. Article corrected. WOW.. Thanks you very much :)!! Click on Search and type 'weather'. Right click on the weather app and choose Pin from the toolbar at the bottom. Anyone can perplex on how to change wind speed in same app from MPH to KmPH? Cheers. No "Weather Preferences" in the sidebar. Made my day a lot colder ! I think the app changed in the RTM and this article is based on the preview version of Win8. There is no preferences menu item, only an "options" item which doesn't contain Celsius. The article has been updated to reflect the changes in Windows 8 RTM. The shortcut technique didn't work for me but I sorted it out using the method you gave at the end of the article. I opened up the metro Weather app and then right clicked on the screen and there was an option popped-up on screen saying "Change to Celsius". I chose that and now everything is now in Celsius. Alternatively, if you want to change the temperature unit to Fahrenheit at any time, right click on the screen of the Weather app (while it is opened, of course), and there will be an option pop up at the bottom right of the screen saying "Change to Fahrenheit". Click on it and there it is, your temperature measurement unit is now in Fahrenheit.